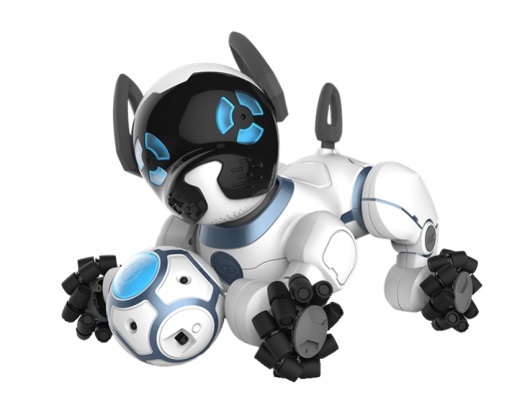 Forget the grandchildren; grandma herself loved her Christmas present of a WowWee ChiP robot dog from HongKong-based WowWee. It’s a great gadget for under $200, packed with features like voice recognition and gesture control. Even the owner’s manual is complete and well-written. But why did the company force grandpa to install four wheel guards, using microscopic-sized Philips-head screws? Very likely they had manufactured and assembled thousands of units before they finished their testing, and discovered a malfunction, and didn’t want to remanufacture them. (It is not clear WHY these wheel guards are needed, but the instructions suggest that they are to prevent the wheels (which are made to look like paws) from becoming choked with dust, hair, or other detritus.) Well, we should praise the company for discovering this and fixing it (of course, it is a lot cheaper than having to deal with a bunch of customer complaints, returns, and reputation diminution), but we will rebuke them for the defective way they did it. The screws were so small that (a) many consumers would not own screwdrivers small enough, and (b) it would be very easy to lose one or more of them (8 were provided, but it would have cost almost nothing and prevented customer problems if they had provided 10 or 12. And the instructions could easily have caused all but the most savvy grandpa (well, maybe they figured that grandpas ARE savvy), because they warn in a footnote that the four wheels are not identical and must be dealt with one at a time AFTER they have said to loosen the wheels. This is typical of consumer products, but we thought that as clever a company as WowWee should know better. And WowWee should have already had a group of nitpickers and/or some savvy UX (Uxer eXperience) engineers doing usability testing, so grandma and grandpa didn’t have to deal with screws they can hardly see. Boy Scout Compasses More Useful Than Handheld GPS Devices? YouTube Autoplay: Bad or Good or … ? John on Boy Scout Compasses More Useful Than Handheld GPS Devices? Whats your most notable blooper today?